Dubai, UAE: Hamptons International, the region’s leading real estate company, has been appointed as the exclusive sales and marketing agent of The Address Residences Jumeirah Resort + Spa, an iconic new development defined by its breathtaking design and supreme location at the end of the Jumeirah Beach Residences (JBR) in Dubai Marina. This is a very exclusive and unique property investment opportunity as it is the last available plot to be built on the beach in JBR. Hamptons International is exclusively responsible for the freehold sale of the residences and serviced apartments in the iconic high-rise, the tallest on Jumeirah beach, directly overlooking the Arabian Sea, Dubai Marina and Ain Dubai, which is set to be the world’s largest Ferris Wheel. Within walking distance of the Dubai Marina Walk, Jumeirah Beach Walk and The Beach, the new property stands out for its shimmering façade and elegant architecture. Hamptons International will launch the sales of the freehold residential and serviced apartments in October. Those interested can register their interest online at theaddressjumeirah.ae. Customers can choose from 1 to 5 bedroom modern apartments inspired by a ‘La Dolce Vita’ themed interior, ranging in size from 650 to 4,300 sq ft. All units have distinctive spaces for working, grooming, relaxing and refreshing while offering spectacular views of its surroundings. The luxury apartments are fitted out with high-quality fixtures, state-of-the-art entertainment and telecom connectivity. 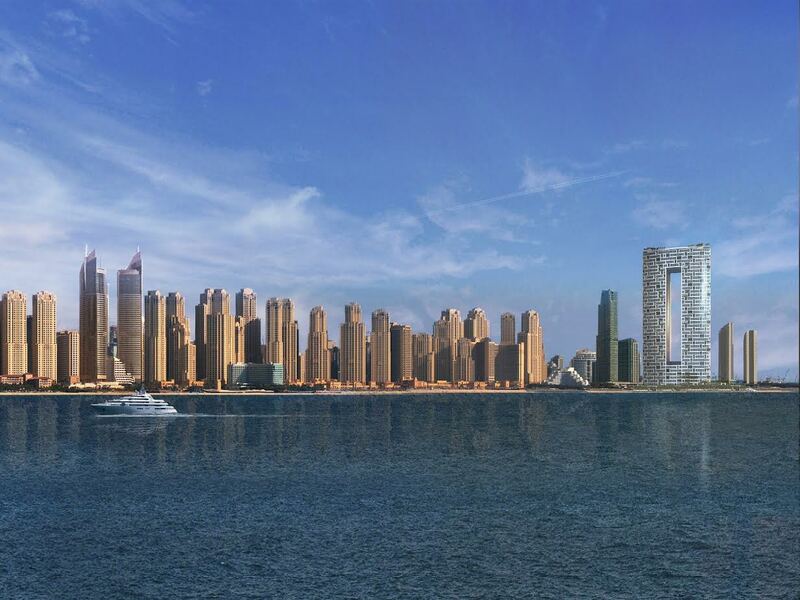 Ahmad Al Falasi, Managing Director, Hamptons International, said: “The residences in this iconic new development on Jumeirah beach offers an excellent and one of a kind opportunity to own a home in one of Dubai’s most prestigious locations. They will be in the heart of what is a waterfront lifestyle central in the city, with five star hotels, shopping malls, restaurants, cafes, and world-class leisure attractions, all at their doorstep. “The Address Residences Jumeirah Resort + Spa also brings the world-class hospitality standards set by world renowned The Address Hotels + Resorts, with a wide range of lifestyle amenities that will enhance the quality of life of its residents. Among the defining features of the development, are direct beach access, the world-class amenities of The Address Jumeirah Resort + Spa, a welcoming lobby that links the two towers and a rooftop infinity pool opening to uninterrupted views of the Arabian Sea. Residents will have access to 100 metres of exclusive beach frontage, and several food & beverage concepts within The Address Jumeirah Resort + Spa including the lounge at the top level. In addition to ease of access to the restaurants and bustling nightlife in the destination, residents can savour their choice of cuisine at a variety of world-class food and beverage outlets in the development. They can also benefit from the ease of access to The Spa at The Address with several relaxation facilities, and a 24×7 fitness centre equipped with the latest, state-of-the-art equipment. Adding to the convenience of the residents, the development will have easy access from Jumeirah Beach Road and steps away from Dubai Tram in addition to Sheikh Zayed Road. The property is set in elegant green landscaped surroundings with outdoor lounges, restaurants and pools. A series of grand stairways on the terraces, allows visitors to walk from the beach up to the lobby level. The Address Residences Jumeirah Resort + Spa assures a home in an unmatched location, with world class quality, services and amenities, offering a superb lifestyle by the beach. Hamptons International is a premier international real estate agent offering an extensive portfolio of properties throughout the UAE and internationally. Its expanding international network of offices spans four continents and includes the UAE, UK, Hong Kong, Saudi Arabia, Oman, India, Egypt, Morocco, Italy, Seychelles and Monaco. In addition to these locations, Hamptons also offers enticing properties in Turkey, Portugal, Pakistan, USA, Thailand and the Indian Ocean. A wholly owned subsidiary of Emaar Properties and with more than 140 years’ experience, Hamptons offers unrivalled expertise and service in the property market. The company continues to expand internationally, positioning it as one of the most valuable residential property groups in the world.